Large and Small - We Train Them All! New Training Facility Now Open In Norco! 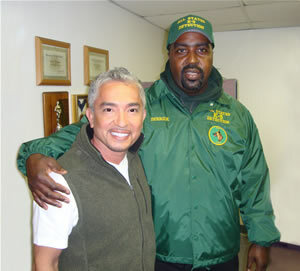 Derrick with Cesar Millan, the "Dog Whisperer"
On and Off Leash - Absolutely NO Food Bribery!! Our Training Method is Based on Respect and Trust. 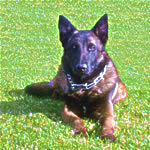 View Our K9 Training Video Demonstration!!!! Love, Praise, Affection and Correction Training Method. Respect and Trust - Absolutely NO Food Bribery! German Shepherd Puppies Available Now! The personal trainer for your dog! 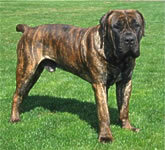 We Train All Breeds 10 Weeks and Older!! It's Never Too Late For Your Dog To Learn!! We Specialize in Problem Dogs!!! Dogs out of control - Leads to animal control! Appointments available 7 days a week 7A.M. - 7 P.M.
"Free Pick Up and Delivery Available"
Our Training Methods are Based on Relationship, Respect and Trust. 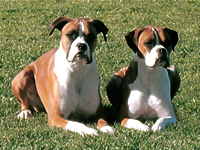 Don't waste your time, or the dogs time, with amateur or rookie dog trainers at your local pet store. Dog training is a profession that requires more then just common sense. 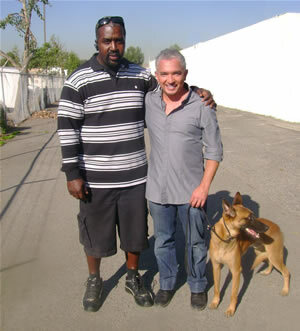 "We will help make your dog into your best friend"
Amazing K-9 dog Training. Professional dog trainers in Los Angeles and Orange Counties, specializing in basic obedience and advanced obedience classes on and off leash, personal protection, home protection, behavioral problem solving, house breaking, aggression, jumping, barking, chewing, digging and much more. 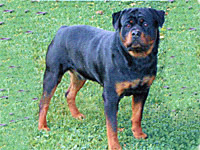 Offering private in home dog obedience and protection training, all training guaranteed for the life of the dog. Free evaluation and consultation available. Easy payment plans to fit your budget. All major credit cards accepted. Free demonstration upon request. We specialize in dogs that can’t be trained at other dog schools. Reward/Praise method, and boot-camp method. 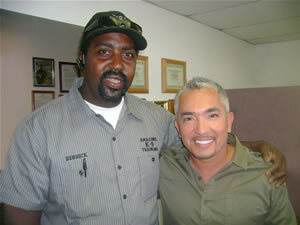 As one of the best dog trainers in Southern California, Amazing K-9 Training will deliver amazing results. Firm and humane most effective training methods. Absolutely no food bribery, verbal and physical praise. By doing so helps your dog enjoy and understand the training. The amount of training you receive is only limited by how much you work with your dog. 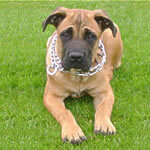 All puppies should begin with basic obedience training at ten or twelve weeks of age. This will help to prevent bad habits from developing and save money due to possible destructive behavior. Please remember be patient with your puppy or dog, this will encourage and help develop their training commands – so if you are in need of help, pickup your phone, give us a call and speak to one of our amazing trainers. Learn how to effectively control behavior on and off leash, from the true professionals at Amazing K-9 Training. If y our want an amateur/rookie video-trained-backyard dog trainer, go to a local pet store or group classes held on Saturday at your local county recreation park. If you are looking for amazing results and customer satisfaction from certified professional K-9 trainers, your have found the right web site. General obedience training can help dogs with behavior problems learn to heel, sit, down, stay, come, etc…it teaches your dog to respect you more. It teaches you how to communicate with your dog more effectively. 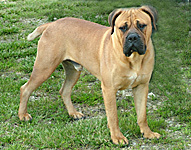 Obedience training is very helpful for dogs that like to jump up; when your dog wants to jump up, have him sit instead. Then your can reward him with praise and attention for sitting instead of jumping up. Remember, some behaviors are easier to prevent than change. Maybe there is a way to remove the temptation and solve the problem. Be consistent in your procedures and in the standards you set for your dog's work; repetition is necessary for your dog to learn. He learns by association, and needs repetition to identify exactly what to associate with what. Concentrate on teaching your dog one thing at a time. He can’t make the associations he needs if the lessons are too complicated for him. Use praise to let your dog know when he’s done the correct thing. Be sure to have plenty of play time as part of the training session. Use play within a training session to keep your dog enthused. Both you and your dog should always look forward to training. 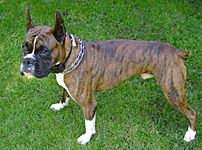 Food-Bribery makes many dogs more aggressive, dominant and dangerous. Be sure your dog can be successful in training. Dogs learn from their earlier successes. Sometimes your have to simplify things more than you thought you would before your dog can understand a lessons and be successful. Any time your dog seems confused, simplify! Back up and divide lessons into small steps. When your add distractions, add them gradually. Gradually increase training challenges in small steps so he can succeed. Use distractions later, to train your dog to be reliable. Using a command in ‘real world’ situations before a dog has been taught to be reliable but can have disappointing results, because the dog will act confused. Some planned distraction training is the ‘bridge’ that many dogs need. Most of all have patience with your dog, so he can become the obedient companion you’ve always wanted. Don’t blame him, train him! It is cruel not to train your dog! Every dog should be trained to become a good citizen. The most important element in training is control. Your must control the dog and your must control yourself. By all means never allow yourself to become exasperated due to frustration. Keep calm and cool. Next to control, is consistency as your most important training aid. Third and most prerequisite to training are patience and firmness. Patience is truly a virtue is training, for without it, you will lose the most important first tool of training – control. You don't need to hurt your dog to train it! Warning to all dog owners! "Professional K-9 Dog Trainers Do Not Bribe With Food." 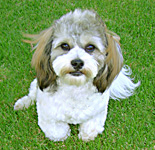 We get dog owners to change their behavior to influence their dog's behavior! Invest in your dog's future! $100.00 - Per Lesson - 1 Hr. $600.00 - 6 Lessons - 3 Wks. $800.00 - 8 Lessons - 4 Wks. $1000.00 - 10 Lessons - 5 Wks. $1200.00 - 12 Lessons - 6 Wks. $250.00 - E-Collar Purchase (Required). $2000.00 - 20 Lessons - 6 - 8 Wks. $2200.00 - 22 Lessons - 6 - 8 Wks. $2400.00 - 24 Lessons - 10 - 12 Wks. $2800.00 - Board & Train - 10-12 Wks. We can teach you how to make your dog obey, even while being distracted. 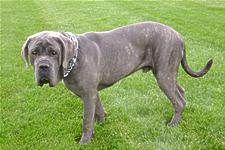 All dogs must have current vaccination records to begin training. Only dogs that have previous obedience training are eligible for enrollment in our protection training program. A well trained dog is a happy dog!